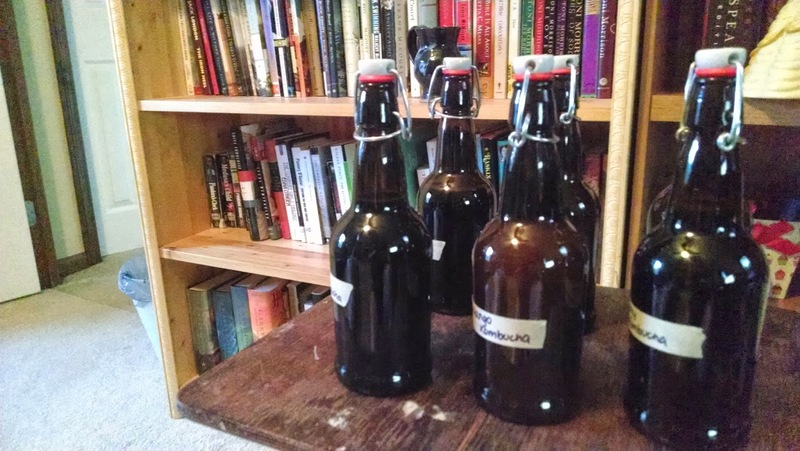 I am well on my way to fulfilling one of my goals for 2014: to homebrew kombucha. I truly thought this would be one of the hardest goals for me to reach, since I had so many hesitations about the process, but it turns out that it's been so incredibly simple, I'm shocked. First, I made a SCOBY. After the SCOBY was ready, it was time for the first batch. 9 days after I started its ferment, it was ready - exactly within the 7-10 day time frame suggested by this recipe that I've been using. I hesitantly sipped a bit of it this evening to test, and was shocked that it was not just fine, but delicious. Had it been colder, I would have probably had a big glass right there. But now comes the fun part - the flavoring and bottling. Mark's favorite kombucha flavor is mango, and I like the berry/cherry type, so we started with mango and cherry juice as flavorings. There are many different ways you can flavor kombucha, or just drink it plain, but we are both fruit kombucha fans. I wanted to use 100% juice to help keep the flavoring pure. First, I removed the SCOBYs from the two jars of kombucha I made. A new circular one had formed in addition to the starter SCOBY I used, which means I now have 4 SCOBYs (which will come in handy a bit later on). I decided that for my next batch I would make a double, so I kept all 4 SCOBYs aside, and also reserved 4 cups of the kombucha as a starter for my next batch. While I was doing this, I had the tea steeping for the second batch. I made a double, which is all the more I can make at one time anyway due to the size of my stock pot. So I'll have enough for about 12 bottles of kombucha at a time going forward, which is how many bottles I have anyway. Next, I pulled out my EZ top glass bottles (after watching a video tutorial about 6 times learning how to get the dumb caps on!). I filled the bottle with a bit of juice (guestimating about 10-20% of the total volume of the bottle being juice). Then I added kombucha, leaving a decent amount of headspace, just like in canning. You leave the space because the kombucha will keep fermenting with the addition of the sugary juice (called a second fermentation) and it will be effervescent. You don't want to blow the lid! I popped the cap on with its tight seal and labeled them simply with trusty masking tape. The bottles (3 cherry and 3 mango) are now sitting for their second ferment for about 3 days in the same spot the kombucha originally was (room temp, out of direct sunlight). So hopefully by the end of this week, I'll be enjoying a cold cherry kombucha on my deck!